Take your pick from hundreds of plants at our annual plant swap. Vegetable plants, herbs, salads, fruit and wildlife-friendly flowers. Sow a few extra seeds now so that you’ve something to share, or just come along on the day and choose your plants in exchange for a donation. Also stalls, refreshments, activities and a two course lunch. Join us from 10am to 1pm on 18th May at Newsome Scout Hall, Huddersfield HD4 6JJ. Community Allotment – can you help? Can you spare a couple of hours on a Sunday morning to help out at our friendly Community Allotment? We’ve got masses of seed sowing and digging to do at this time of year, so any time you can give will really help our growing community. Please come along for a look around and to find out how to get involved. You can find us at the allotment most Sunday mornings. Please Contact us if you’d like to know more. Photo: Thank you to Coronation Street’s Simon Gregson for visiting our allotment to help promote our involvement in the National Lottery Awards. What happens at our Big Plant Swap? or follow @NewsomeForum on Twitter. Bought some of our jam? Did you know that you can return your empty jars to us? We can reuse the red and white check caps and plain silver caps as well as the jar. We also collect clean, small jars: 1 Ib, 12 oz or 8 oz especially. You can bring your empties along to any of our events or drop them off at any Newsome Forum meeting, held on the second Thursday of January, March, May, July, September and November in the Community Room at Newsome High School. The meeting starts at 6pm and you can drop things off from 5.45pm. Want to know what’s coming up next? Our Newsome Food Calendar is an ever-growing list of local food activities in the Newsome Ward, including upcoming events at Stirley Farm. We have a Community Allotment for anyone who lives in the Newsome Ward to share. It’s ideal for anyone who wants a bit of support with allotment growing, or anyone who can offer advice to novice growers. By getting together, we’re all helping each other to grow our own food there. You’re welcome to come along as little or as often as you can, weekdays or weekends. If you’d like to join in, we’d love to hear from you. Please contact us to find out more. 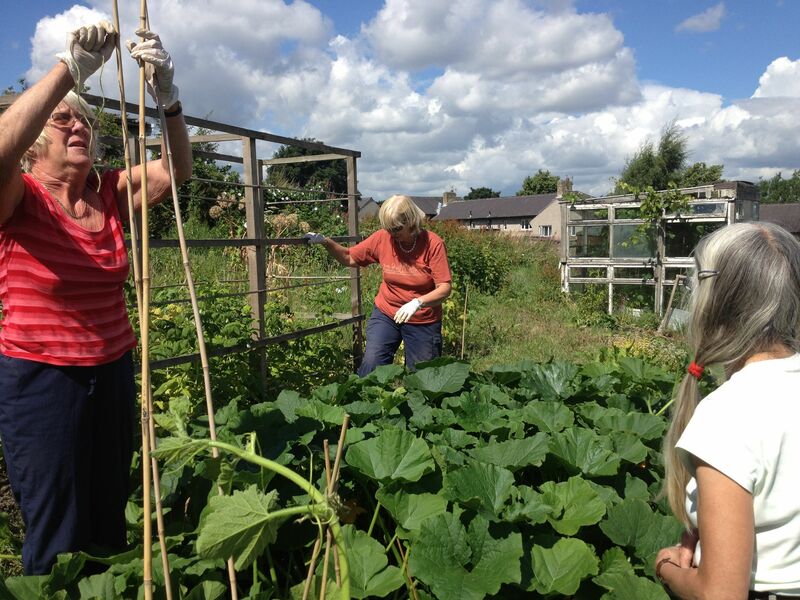 Allotment Sundays – we’re at the community allotment most Sunday mornings. Growing Newsome are a thriving community of food growers in the Newsome Ward of Huddersfield. We aim to build and strengthen relationships between local residents through the shared activity of growing and eating our own local food. We are encouraging Newsome residents to work together to share our valuable skills and resources, so that we can learn how to grow together. We are working with Newsome Ward Timebanking to help people share their skills.